I belong to a online book trading group. As I had a lot of points for books, I decided to get some cookbooks. There were several listed to be traded and one of them was this one. 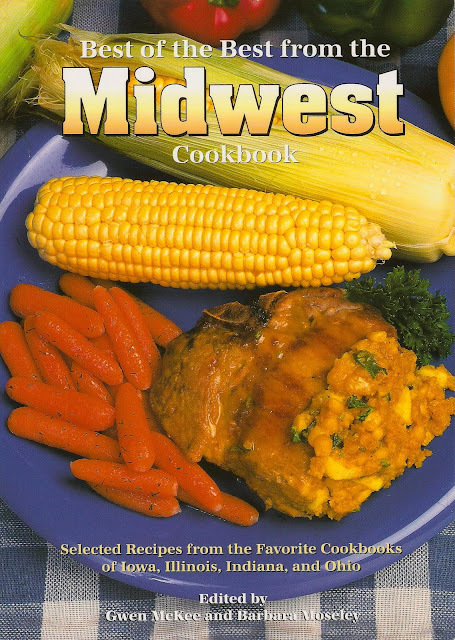 The title sold me on it without seeing it as it was Midwest cooking. What could be more suitable for someone from Minnesota and Iowa. Free is always nice also. The cookbook The Best of the Best from the Midwest is from a regional series. The authors have done their research well, and I am certainly going to look for more in this series. The cover is attractive and draws the eye. The recipes will keep you cooking. One of the things I liked is that they tell you from what cookbook and state the recipe is from. If you like the recipes you than have an idea where to look for more. So far the recipes I have tried have been very good and I hope if you see a copy of this cookbook you give it a try. I would love to have this cookbook and will actively look for it online. Thank You! If you click on the picture, it will enlarge and you can see the authors names. That might help you find a copy of it. I was able to order a copy of the book from Amazon and in fact got it for less than three dollars at a used online book store they list as one of their sellers...well S&H was almost $4 but am very happy..thanks so much. Glad to hear that you got a copy. Hope you enjoy it. Have a great New Year.